This is a really impressively visual movie with some incredible performances. Some of the choices were spot on - having the Macbeths explicitly grieving a deceased child works each and every time the film touches on that. And the choice of embers to fulfil the prophecy of Birnham Wood coming to Dunsinane was actually genius - and gorgeous to boot. I do feel that, though, by making Lady Macbeth explicitly grieving - and hallucinating her dead child - that some of the impact of her character is lost. Some of her rough edges have been sanded down by the adaptation and the direction. Cotillard is magnetic on screen but her Lady M just doesn't feel as manipulative or power hungry as I like my Lady M to be. Fassbender is compelling, too - though I never felt like his Macbeth was being manipulated, not really. By making the power dynamic between Macbeth and Lady M a little more even dulls the tension. The battle scenes are suitably epic and the burning-at-the-stake stuff was really hard to watch. Overall, I'm glad we've got another big screen Macbeth. Gorgeously shot, incredible acting from Fassbender and Cotillard (naturally). But sometimes the careful staging and slo-mo shots made me feel distanced from the story. I love pathos and blood of Macbeth, and I think I wanted something grittier. This version felt more restrained. Tense and violent to be sure, but in a cold-blooded way. I loved the interpretation of the witches and the use of the ghost boy-soldier in Macbeth's hallucinations. I can't look for the link just now but I read an article a couple months ago, after I saw the film at the Chicago Film Festival, where Fassbender said he and the director approached the character of Macbeth as if he has PTSD from all the battles he's been fighting. As soon as I read that, so many of the choices of the film made complete sense - not that they didn't make sense at all on first viewing, just that they became so much more clear and purposeful. Particularly, I think, the pacing back and forth in the castle. The only thing for me, particularly in the first third, was how dim it was. I mean, I get "candlelight is dim," but I really found myself wondering if the projector was calibrated properly? 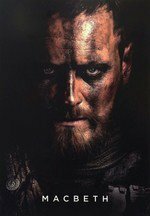 I also find it amusing how the video trailers for this make it look like they've turned Macbeth into Braveheart, with lots of bloody, muddy action, but in the end the film is rather hushed, quiet, and intense. Yeah, the acting was great, but much more subdued than I prefer for Macbeth. This is a story with witches, ghosts, and hallucinations; I don't mind it being over the top. The cinematography, though, was unbelievable. There wasn't a frame of this film I didn't love visually. Score and costuming were wonderful too. Also, I realized too late that this is not a great introduction to someone who doesn't already know the story. They cut and rearranged quite a bit. Overall, not my favorite interpretation, but still one I'm extremely glad I saw. Well, it is extraordinarily difficult to stage effectively. This movie is metal as hell. The cast in this is excellent and the cinematography really stood out to me. This is now streaming on Amazon Prime if you're interested in viewing it.